Merwilla is a segregate genus in the Hyacinthaceae family containing species from the genus Scilla. 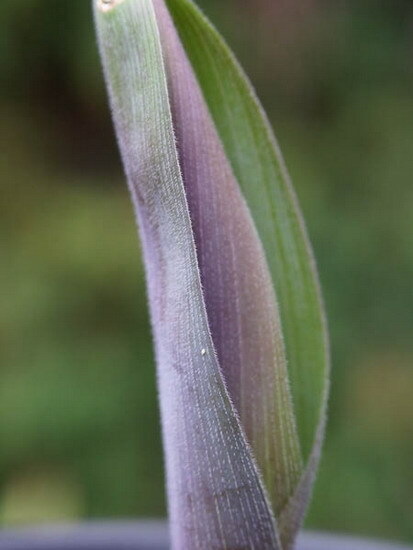 Recent scientific studies using molecular systematics have shown that what we know as Scilla actually appear to have multiple evolutionary origins. Therefore it seemed reasonable to recognise each coherent group as separate genera. Merwilla is in the sub-Saharan African/Indian group. The name change to this group has been accepted. The three species listed below are from South Africa, summer-growing, winter-dormant with one scape per season, seeds whitish and papery and with unfertilised flowers that drop off. For more information about the proposed Scilla changes consult Julian Slade's post. Seeds must be absolute fresh when sown, as old seed does not germinate (probably a 6 month viability period). It should be sown in spring on the surface or barely covered, and germination will be rapid (7-10 days). Small bulbs will form before winter, at which time they will become dormant, coming into growth again the following spring. Seeds of M. plumbea takes 4-7 years to mature (Bill Dijk). 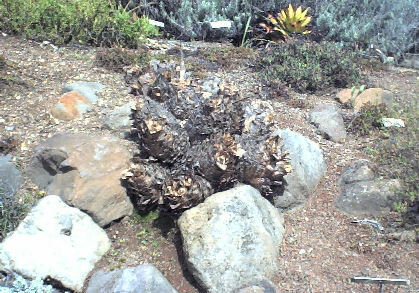 Merwilla dracomontana (syn. 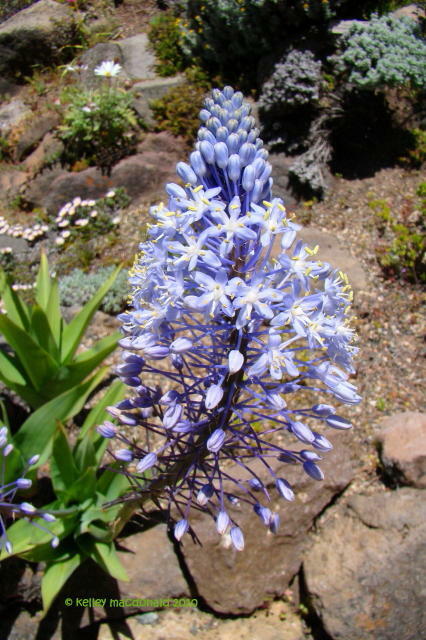 Scilla dracomontana) is a dwarf species found in the Drakensberg mountains of KwaZulu-Natal. It easily hybridizes with M. plumbea. 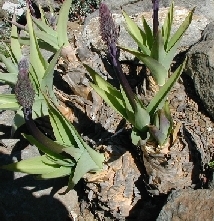 Merwilla plumbea (syn. 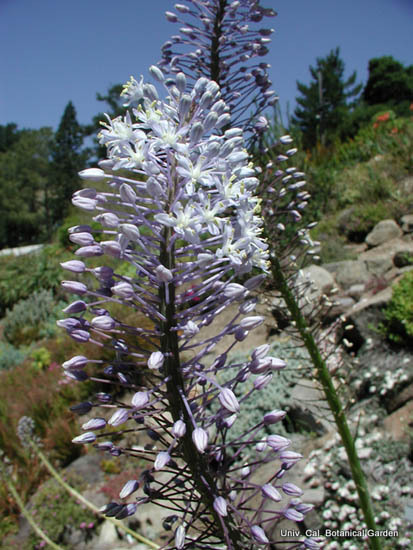 Scilla natalensis, Merwilla kraussii) is from the summer rainfall area of South Africa. It appears to be hardy to Zone 7 and tolerant of rain during the winter although it is not hardy and will die with hard frost. With regular water it may remain evergreen. It has been described as flowering in spring, summer, and fall perhaps depending on when it received water. Sometimes the leaves appear after the flowers. It was the subject of an extensive discussion on the PBS list in March 2003. 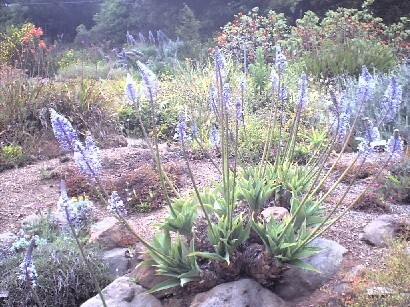 The first picture is of a large clump in the UC Botanical Garden when they were dormant followed by more pictures of spring blooming plants at UC Berkeley in early and later phases of bloom and showing how they need a lot of space. The first three photos were taken by Liz Waterman and the last by Kelley Macdonald. The first picture of the flowers with the sky in the background was taken by Bill Dijk. 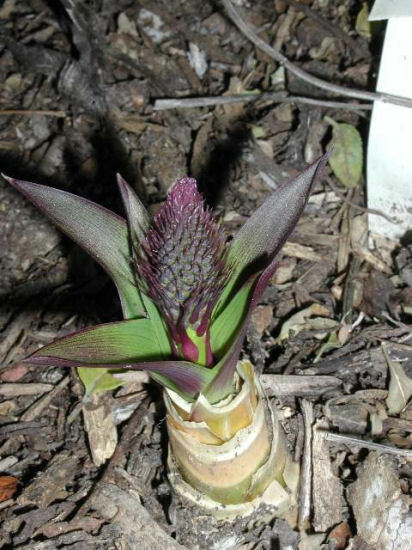 The second photo by Jana Ulmer shows a first bloom emerging in March 2003 from a plant started from seed in December 1997. 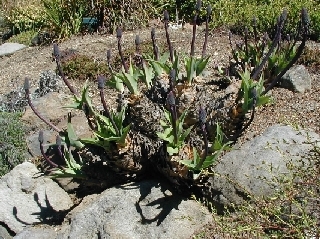 The third picture is of one is blooming in the southern California garden of Doug Westfall where it is growing in a container. The fourth picture captures the beautiful colour and texture of fresh spring growth, by Jacob Uluwehi Knecht. 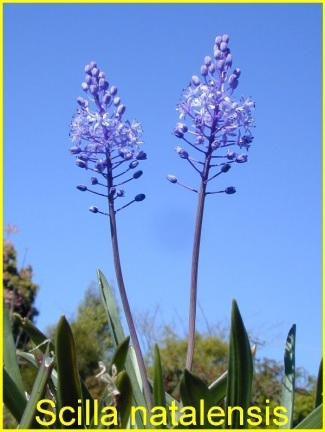 The last photo was contributed by theUC Botanical Garden showing a nice inflorescence.